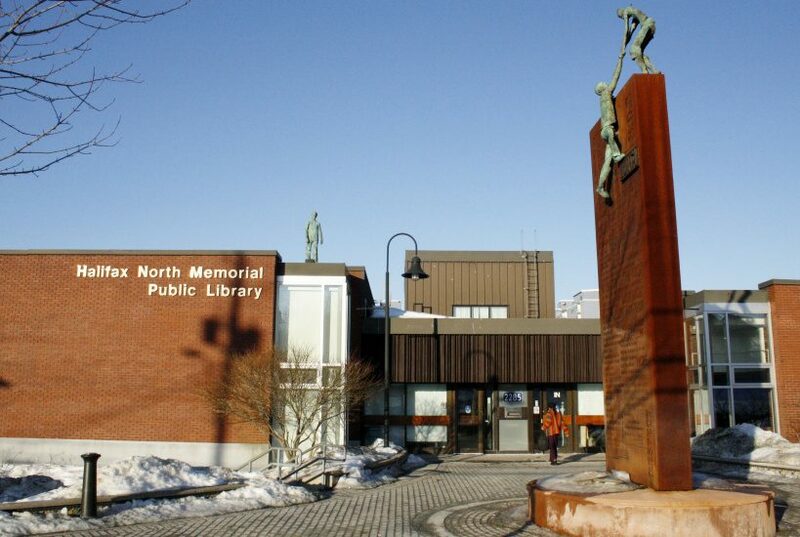 Halifax North Memorial Library, only open 5 days a week! KJIPUKTUK (Halifax) – Halifax Council’s determination to limit this year’s property tax increase to 1.9% will lead to a sizeable reduction in staff, Halifax head librarian and CEO Åsa Kachan told the Council’s budget committee on Friday. That inevitably means programs and services will be impacted, she said. Even the proposed budget Kachan presented to the councillors, a budget aligned with a slightly more generous 2.9% tax increase, is problematic. Holdings per capita, library space per capita, and spending on materials per capita all fail to meet benchmarks based on average spending among peer jurisdictions. It is doing so for the third year in a row, Kachan’s presentation showed. Staying within the constraints of a 1.9% tax increase means that the library budget must be further reduced by $350,000. That would force the library to eliminate between 4 and 8 full time equivalent positions. The hope is that such a reduction can be managed through retirement and attrition, Kachan explained. As a result, “the community would have reduced access to information services and learning programs, free public use computers and WiFi, programs and spaces that improve literacy, digital literacy and promote social inclusion for all,” Kachan’s presentation stated. Also on the chopping block is $100,000 in new money to continue a successful food literacy program and a program that aims to reduce isolation among poor people. Cuts to the Halifax public library system have been an ongoing problem for a long time. Since 2007-08 the size of the collection has continued to decrease,” states the 2014-15 performance update, blaming budget constraints and higher costs of items, among other factors. Keep in mind that even today the bustling North End library is closed two days per week, Kachan reminded councillors on Friday. At the end the budget committee decided to defer a decision, with the final decision to be made in a budget committee meeting on February 28. Whether the cuts to the library budget will be abandoned at that time remains to be seen. The budget committee has already deferred decisions on some $7,000,000 worth of cuts. Meanwhile, the Halifax library system continues to be a tremendously popular. Library visits, library use, and program attendance all exceed averages among comparable jurisdictions. This speaks to the quality and dedication of our library staff, and their understanding of the role of public libraries, which is about so much more than lending books. Many people can’t afford computers and internet access and check their email at the library, sometimes more than once a day. They did so 4,200,000 times last year, to be precise. Libraries offer a welcoming and safe place for kids hang out after school. It’s where they can do their homework undisturbed. It’s where community members meet, to chat or use a meeting room for a more formal gathering. It’s where you get help with your income tax forms, where immigrants learn english, where you take your toddler for a puppet show. Where a homeless person can find shelter. Meanwhile, the $350,000 that’s on the cutting block is minuscule, considering that Halifax total operational budget is set at $760 million. Check out video of Friday’s budget committee here. Cut somewhere else. The Public Library is an essential service. And FFS, don’t build that stupid stadium. This was a great overview of the situation and why our libraries are so essential. For every dollar we spend with our libraries, especially with early literacy programs, our municipality gets back at least $5 in a Return on Investment. We need to be considering expanding our libraries, not cutting them. Thank you for sharing this article. The Public Library is an essential service for so so many people, young and old. Don’t build that stupid stadium, money can be better spent on more important things. If you can afford a stadium then you most certainly can afford the library. Get priority correct and fund the library! The Library is an absolutely essential service and should not be cut. Think of any group in society: students, seniors, new immigrants, mothers with babies and infants, children, especially those from poorer backgrounds who use this service, and others, and we will soon see how valuable the existing library system is in Halifax and Nova Scotia. I really love the library system here, it’s one thing I can boast about when I travel to other places both in other provinces and abroad. One of the cutest things I heard was when a preschooler entered the Cole Harbour Library and belted out to the nearest library staff: “Hi, remember me?” The nearest library worker had the buggest smile when she retorted: “Of course. How could I forget?” Our libraries and the frontline library staff make Halifax a kinder more interesting place to live in! I worry the home delivery service will be eliminated someday. Getting that delivery of books, movies, and magazines every three weeks for nearly 20 years is the only thing I have to look forward to. Watching movies is the only relief I get from my very stressful life. It’s like therapy, and I have had many great conversations with the staff on the phone and the delivery person at my door. They are angels and it would be devastating if any of them lost their jobs. “…a successful food literacy program and a program that aims to reduce isolation among poor people.” Of course, it’s always something that’s for persons on low incomes that gets the axe first.